The centerpiece of your dining room must be reliable, appealing and functional. The furniture we make at DutchCrafters is handcrafted to meet these requirements. 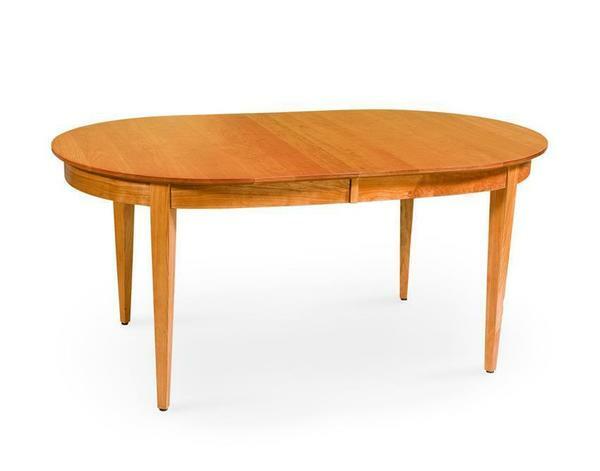 Our Amish Shelby Dining Table presents a simple style table with an oval table top and slender tapered legs. It can fill the role of birthday party table, Thanksgiving banquet table, family pizza night table and ice-cream sundae table with ease. Handcrafted in the woodshops of Northern Indiana, this Amish dining table will proudly serve your family for all of your most important occasions. This Dining Table is shown with our Shelby Dining Chair. shown with Shelby chairs from LaGrange Amish Chair Collection and Shelby Extend-A-Bench.